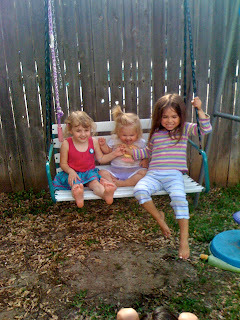 Friday Jane and Jena and I went over to my friend Laura's house for a playdate. Jane and Elizabeth dressed up like fairies and Ben was the dragon. They were so cute and very involved in their made up game. It was nice to be able to just let the kids play while Laura and I talked! Are our kids that old already? As for Jena, we took her to the opthomologist last week and were told that her colobomas were worse than what we were expecting. We thought that Jena just had colobomas of the irises but were told that she also is missing part of both of her retinas and also part of her choroid in one eye (the other eye he couldn't tell yet). All of this means that Jena will have serious vision problems and quite possibly will be legally blind, being able to see movement and light but not much else. I asked the doctor if she would be able to drive or read and he said at this point he simply couldn't tell. We were also told that Jena will need to have an MRI done very soon. The doctor said that the structure of the eye was very closely related to the structure of the central nervous system and being that she is missing so much of her eyes she needs an MRI to see if she has all of the parts of her brain. Then in a few months she needs another test to see if her brain is detecting light, patterns, etc... We still have not received any results from the blood tests taken at the hospital so we are very much appreciative of all of your continued prayers for good blood test results and now for good news from her MRI. 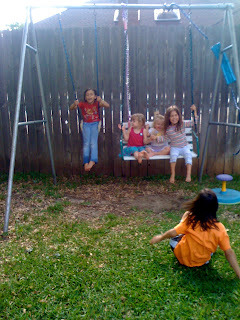 On Friday our family went over to our friend, Rachel's house. She has three girls that are good friends with my girls and we planned to make stepping stones for Mother's Day gifts. 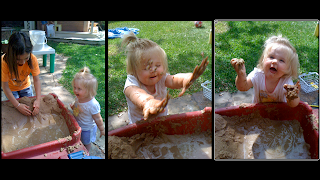 Rachel set up the sand and water table and Jill had somewhat of a good time playing in the wet sand with Chloe. 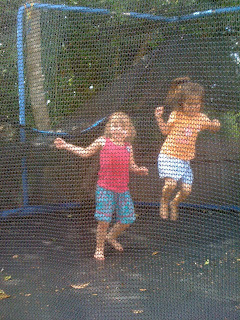 Jane jumped on the trampoline with Julie. 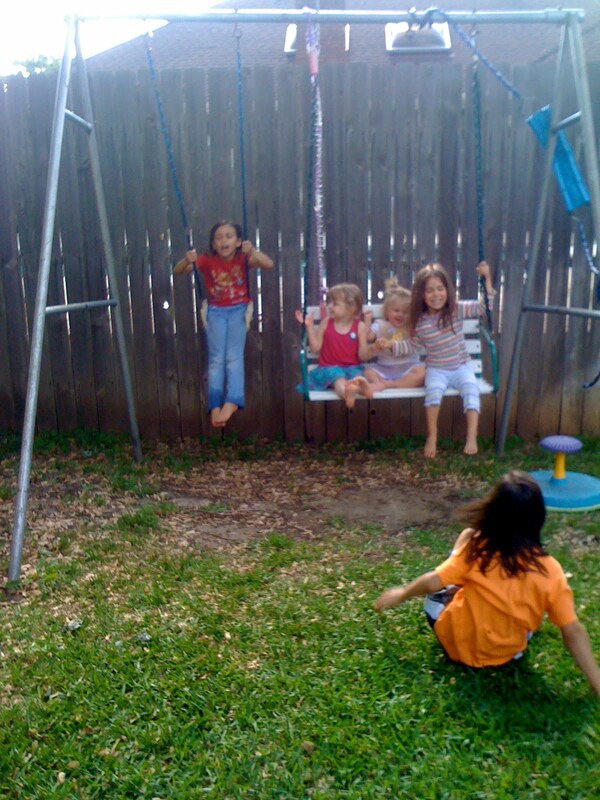 Then they all had a great time on the swing set. Below is Heidi on the left. 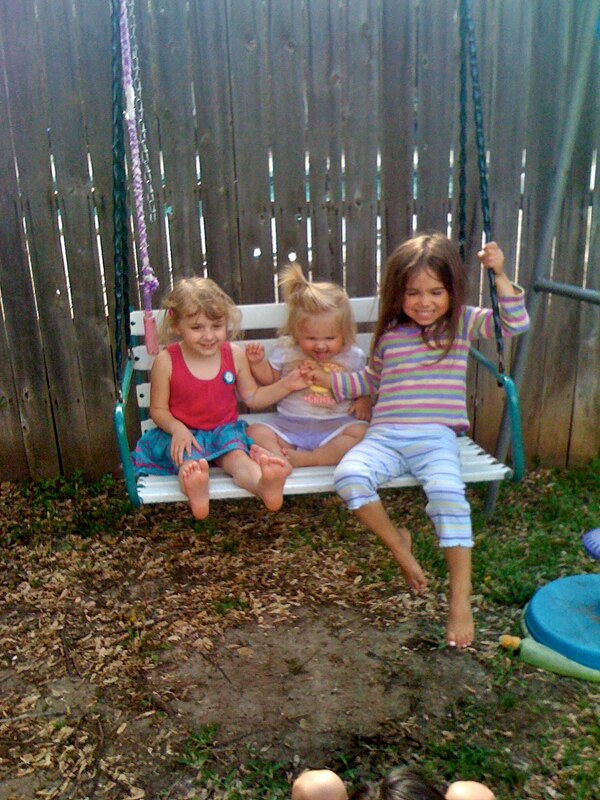 Jane, Jill and Julie are on the bench swing and Chloe is on the ground in front of them. 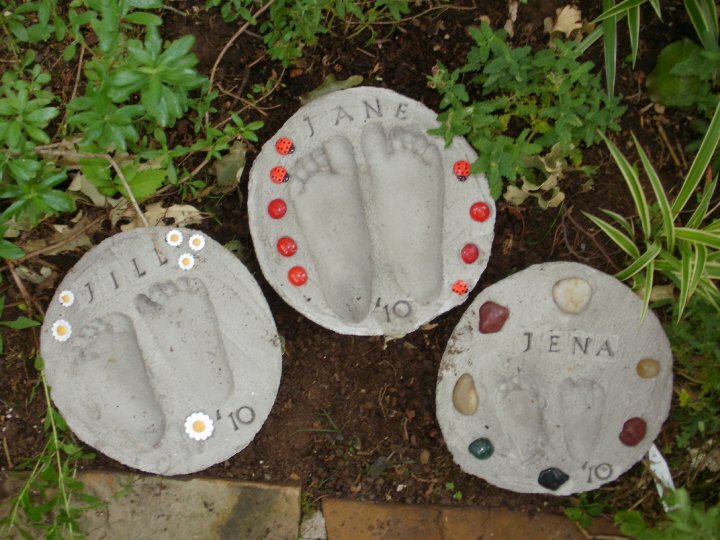 Below are the stepping stones we made for my mom for Mother's Day. I think they turned out so cute! This is the one I had the girls make for me for Mother's Day. 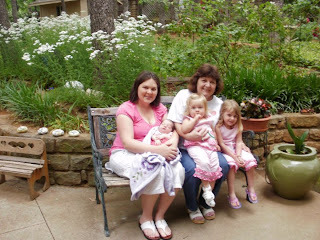 Here we all are on Mother's Day with my wonderful mom! Happy Mother's Day mom!!! I love you!